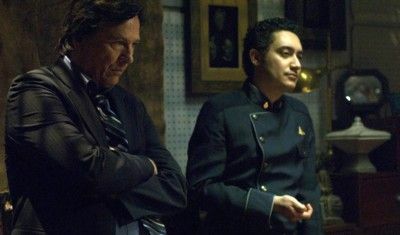 Adama’s on trial, the President’s trapped on the Cylon baseship, anyone with a Cylon connection is in the brig and Zarek uses absolute power on the Quorum of Twelve. Not quite as good as last week’s, but only in the way “The Best Of Both Worlds, Part II” isn’t quite as good as Part I. While the cliffhanger’s resolved a little too neatly, this episode gives its cast plenty to chew on. Adama’s stoical refusal to bow to his captors’ demands is completely in character, while Roslin’s rousing call-to-arms speech is inspiring stuff. Even the cheesy-as-hell scenes of Adama marching on the bridge, surrounded by a posse of loyalists, makes you feel warm inside – Galactica may have a reputation for misery, but it’s also capable of uplifting moments like nothing else on TV. But the episode belongs to Richard Hatch and Alessandro Juliani as the doomed Zarek and Gaeta. Zarek becoming drunk on power – going as far as executing his political rivals – was always a possible fate for the character, so the fact that he takes Gaeta with him makes the latter’s tragedy all the greater. The look shared between the two as they prepare for execution is proof that silences can say much more than words. Gaeta ordered Adama’s execution by phone. Adama had the guts to do it in person.